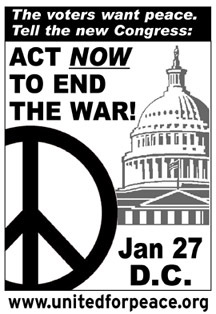 United for Peace and Justice (UFPJ) is a coalition of more than 1400 local and national groups throughout the United States who have joined together to protest the immoral and disastrous Iraq War and oppose our government's policy of permanent warfare and empire-building. The National Coordinator is Leslie Cagan. United for Peace and Justice is a partner organization of the Institute for Policy Studies. Several Marxist organizations are involved in the UFPJ leadership but the most influential has been the Communist Party USA, through members and Steering Committee such as National Coordinator Judith LeBlanc, Steering Committee members such as Jacqueline Cabasso, Libero Della Piana and Siri Margerin and affiliate leaders including Rosalio Munoz, Alfred Marder and Erica Smiley. The UFPJ Steering Committee voted on at UFPJ's 4th National Assembly December 12-14, 2008 in Chicago. Lisa Fithian -- Alliance for Community Trainers Inc.
UFPJ affiliates as of July 17, 2007. UFP sent out an email on October 10, 2004 about their "November 3rd Pledge of Action" if they suspected voter fraud in the November 2004 presidential election. The complete text of this message and its supporters is as follows. "We all remember the votes that were never counted in Florida 2000. So, where we are all working hard for a positive outcome on November 2nd, we also have to be prepared for a repeat of a 2000 stolen election. Below is a pledge for people to sign, supporting efforts to mobilize and protect the vote on November 2nd and making a commitment to protest starting on November 3rd in the case of a fraudulent vote count. By signing this pledge, you will be joining with thousands of others in the November 3rd Urgent Response Network. Please sign the pledge at www.nov3.us and pass it around far and wide." "We are setting up a Fair Elections Advisory Council made up of U.S. and international election experts who will give us their assessment on election day itself. If they find significant fraud, we will activate the Urgent Response Network on or immediately after November 3rd, calling on people everywhere to engage in protest, including non-violent civil disobedience, in front of their local federal buildings and other appropriate places. We will also be asking those who can to converge in the states where the most serious fraud occurred, as well as in Washington, D.C."
"In addition to signing the pledge, please work with other people and groups in your area to protect the vote on November 2nd and to build the Urgent Response Network. Pick a venue for your local protest in the case that the Urgent Response Network is activated, and list the time and place on the website at www.nov3.us. We also recommend that you set up a place to jointly watch the election results on November 2nd." "Let us commit ourselves to making sure that this time around, the person who occupied the White House is the one who won the election." "November 3rd Pledge of Action"
"I remember the stolen presidential election of 2000 and I am willing to take action in 2004 if the election is stolen again. I support efforts to protect the right to vote leading up to and on Election Day, November 2nd. If that right is systematically violated, I pledge to join nationwide protests starting on November 3rd, either in my community, in the state where the fraud occurred or in Washington DC." Robert McChesney - Free Press; college professor, marxist, and leader of the movement for "Net Neutrality"
On Jan. 27, 2007, peace activists "converge[d] from all around the country in Washington, D.C. to send a strong, clear message to Congress and the Bush Administration: 'The people of this country want the war and occupation in Iraq to end and we want the troops brought home now!'". The Committee to Stop FBI Repression lists United for Peace and Justice as one of the organizations that has issued a statement of solidarity in support of the activists raided in the September 24, 2010 FBI Raids. An anti-war forum entitled “Syria & Iran: The Next War?” was held in New York, June 10 at the Solidarity Center. It featured anti-war veterans from the Iranian, Israeli and U.S. militaries, and was organized by United for Peace and Justice, Veterans for Peace and the U.S. Peace Council. The International Action Center hosted the meeting and IAC co-founder Sara Flounders chaired. All the speakers were members of the VFP Iran Working Group. This page was last modified on 8 January 2016, at 00:43.